Nicotinamide adenine dinucleuotide (NAD+) is a ubiquitous molecule present in all cells and tissues of the body with an important role in the redox reactions and metabolism. Small changes in NAD+ levels may lead to oxidative stress and may be a cause for various disorders. Currently, NAD+ can be detected in vivo only by 31P NMR spectroscopy. Recently, NAD+ measurement with 1H MRS in the human brain with a surface coil was demonstrated. In the present study, we show a novel MR pulse sequence for the in vivo, single voxel localized detection of NAD+ from the human brain at 7T. In GABA-edited spectroscopy signal of macromolecules overlaps the signal of GABA. This macromolecular contribution to GABA signal (GABA+) is variable throughout the brain and can bias the quantification. We aimed to map the signal of macromolecules at 2.99 ppm using metabolite-nulled 3D MEGA-LASER MRSI. We found the GABA+/total creatine to be higher in white matter (45%), which contradicts the literature. 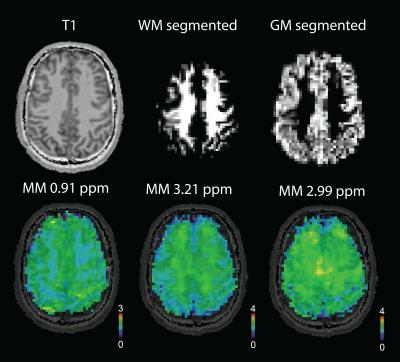 The MM2.99ppm was found higher in white matter as well (24%). The macromolecular tissue distribution is among other factors affecting the GABA+ signal, therefore the detection of GABA is preferable to GABA+ if the removal of macromolecules is possible. Although ultra-short TE spectroscopy sequences enhance the information content of the spectrum, they are, in their nature, prone to quantification biases if the macromolecular (MM) components are not taken into account The aim of this study, was to 1) perform macromolecule mapping at 9.4T using an ultra-short TE double-inversion recovery (DIR) MRSI sequence, 2) model and parametrize the individual MM components, and 3) extract high resolution maps of individual MM components using the modelled MM basis set. Many central nervous system (CNS) abnormalities lead to significant changes in the microenvironment of glutamatergic neurons, which may alter relaxation times of glutamate. 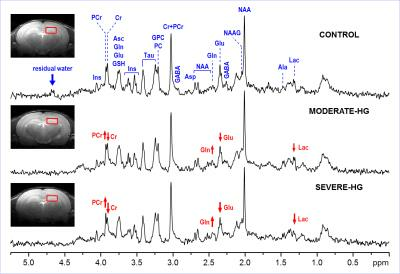 In this study, a method for simultaneously determining T1 and T2 of glutamate at 7T was presented. 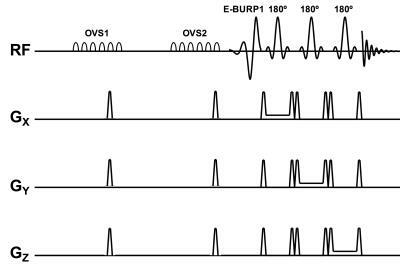 The method uses a point resolved spectroscopy (PRESS) sequence with multiple echo times, inversion-recovery times and RF suppression of aspartyl moiety of N-acetyl-aspartate (NAA). Metabolite cycled semi-LASER and STEAM at 9.4T. Comparison and in vivo results. The purpose of this study was the development of two new localization schemes for ultra high field (UHF) spectroscopic applications while utilizing the advantages of the Metabolite Cycling (MC) technique. 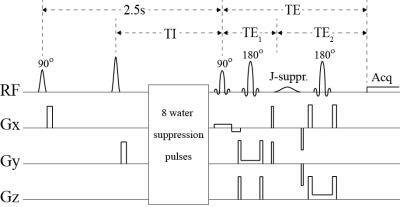 In particular, a semi-adiabatic asymmetric pulse optimized for MC at 9.4T was incorporated into STEAM and semi-LASER localization schemes. In this study, these two new sequences along with the appropriate hardware setup were used to acquire in vivo 1H MRS data from the occipital lobe of the human brain and compare the corresponding results. In addition, the effect of frequency and phase correction based on the MC water spectra on data quality was investigated. Paediatric brain lesion classification using 3T MRS: Comparison of different pattern recognition techniques, A multi-centre study. The purpose of the study was to investigate the discriminative potential of metabolites obtained from 3T scanners in classifying paediatric posterior fossa brain tumours by comparing performance of three different pattern recognition techniques on a multicentre data set. A total of 52 paediatric patients with cerebellar tumours (16 Medulloblastomas, 31 Pilocytic Astrocytomas and 5 Ependymomas) were scanned using PRESS, TE 30-46 ms, across 4 different hospitals. Achieved balanced classification accuracy were 88% with random-forest, 84 % for the support-vector-machine and 81% for naïve-bays classifier. The achieved accuracy was better than the balanced accuracy previously reported for multi-centre datasets at 1.5T. 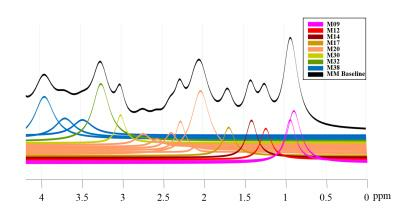 Diurnal factors such as brain temperature, hydration and osmotic regulation have the potential to change metabolic profiles in two dimensional localised correlation spectroscopy (2D L-COSY). Ten Healthy subjects underwent repeated 2D L-COSY on a 3T system over a 10hour period at three time points (0700, 1200 and 1700) to evaluate diurnal effects on brain neurometabolites. Results show significant diurnal effects between morning and evening scans. The present findings highlight the importance of maintaining a specific time when spectral data is acquired, especially in longitudinal studies where the dynamic nature of subject can present a confounding factor. Transcranial direct current stimulation (tDCS) modulates human behavior, neuronal patterns and metabolite concentrations. 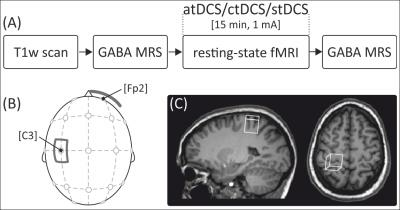 To unravel tDCS-induced alterations on the neuronal level we investigated tDCS-induced effects in older adults (50-79 years) using MRS to quantify GABA levels and resting-state fMRI to assess sensorimotor network strength and inter-hemispheric connectivity. Anodal, cathodal and sham tDCS were applied over the left sensorimotor region in a randomized, cross-over design. Compared to sham, anodal tDCS induced significantly reduced GABA levels, representing local plasticity, as well as lower large-scale network coupling and inter-hemispheric connectivity. Adaptations in brain lactate handling in response to hypoglycemia may play a role in the pathophysiology of impaired awareness of hypoglycemia (IAH). Therefore, we determined the effect of high-intensity interval training (HIIT)-induced hyperlactatemia on brain lactate during subsequent hypoglycemia in type 1 diabetic (T1DM) patients with IAH, in T1DM patients with normal awareness of hypoglycemia (NAH) and in healthy controls. 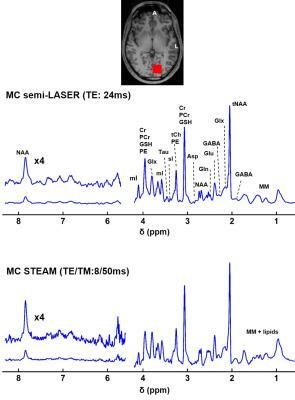 Brain lactate concentration was determined using a J-difference editing semi-LASER 1H-MRS sequence. After HIIT, brain lactate concentration increased most in T1DM IAH, consistent with an enhanced lactate transport capacity, and also dropped most during subsequent hypoglycemia, suggestive for increased lactate oxidation. Long-term Effects of Recurrent Neonatal Hyperglycemia on the Hippocampal Neurochemical Profile of Rats. Hyperglycemia is common in extremely low-gestational-age neonates (ELGAN) and increases the risk of serious health problems in the neonatal period. However, the long-term effects are not well understood. The purpose of this study was to assess long-term effects of the recurrent neonatal hyperglycemia on the hippocampal neurochemical profile. Metabolite changes were quantified by in vivo 1H MRS at 9.4T using a rat model of neonatal hyperglycemia. The results of this study indicate that the recurrent hyperglycemia during neonatal period may alter energy metabolism and glutamatergic neurotransmission, which can contribute to delayed hippocampal development and cognitive deficits in ELGANs.